The world´s top selling UK published specialist shipping magazine for enthusiasts and maritime professionals. 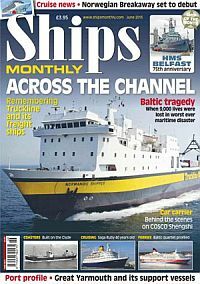 Ships Monthly is the ultimate resource for both seafarers and enthusiasts who enjoy reading the latest news from the ferry, cargo, cruise and naval scenes together with informative articles written by experts on a huge range of shipping subjects from historic ships and shipping companies to interviews with industry professionals and the latest shipping developments. Not only is the photography wonderfully inspiring but the comprehensive editorial devoted to both modern and archival ships and shipping artistry makes it a valuable resource to be referred to time and time again. Published in English - Monthly. Allow 6-10 weeks for initial delivery.